The setting had been picked out -- all that was needed was an aurora. And late last August, forecasts predicted that an otherwise beautiful night sky would be lit up with auroral green. 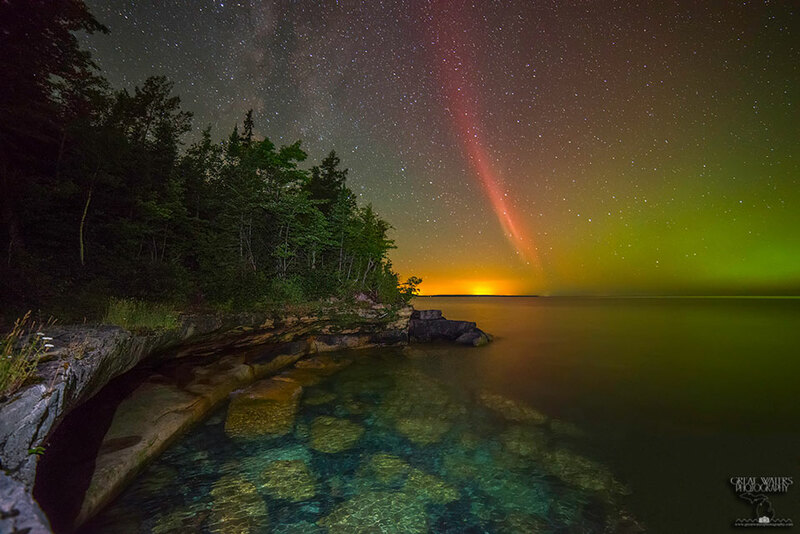 Jumping into his truck, the astrophotographer approached his secret site -- but only after a five hour drive across the rural Upper Peninsula of Michigan. What he didn't know was that his luck was just beginning. While setting up for the image, a proton arc -- a rare type of aurora -- appeared. The red arc lasted only about 15 minutes, but that was long enough to capture in a 30-second exposure. As the name indicates, proton arcs are caused not by electrons but by more massive protons that bombard the Earth's atmosphere following an energetic event on the Sun. In the featured image, the yellow lights on the horizon are the city lights of Marquette, Michigan, USA. The blue and yellow rocks in the Lake Superior foreground are lit by a LED flashlight. Also captured, to the left of the red proton arc, was the band of our Milky Way Galaxy. What's that approaching? Astronauts on board the International Space Station first saw it in early 2010 far in the distance. Soon it enlarged to become a dark silhouette. As it came even closer, the silhouette appeared to be a spaceship. Finally, the object revealed itself to be the Space Shuttle Endeavour, and it soon docked as expected with the Earth-orbiting space station. 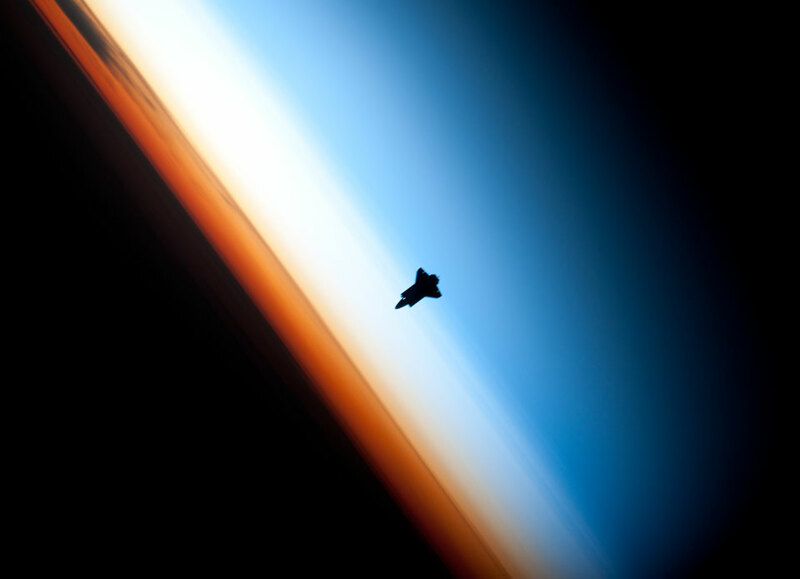 Pictured above, Endeavour was imaged near Earth's horizon as it approached, where several layers of the Earth's atmosphere were visible. Directly behind the shuttle is the mesosphere, which appears blue. The atmospheric layer that appears white is the stratosphere, while the orange layer is Earth's Troposphere. This shuttle mission, began with a dramatic night launch. Tasks completed during this shuttle's visit to the ISS included the delivery of the Tranquility Module which contained a cupola bay window complex that allows even better views of spaceships approaching and leaving the space station. A careful look at this colorful cosmic snapshot reveals a surprising number of galaxies both near and far toward the constellation Ursa Major. The most striking is NGC 3718, the warped spiral galaxy near picture center. NGC 3718's spiral arms look twisted and extended, mottled with young blue star clusters. Drawn out dust lanes obscure its yellowish central regions. A mere 150 thousand light-years to the right is another large spiral galaxy, NGC 3729. 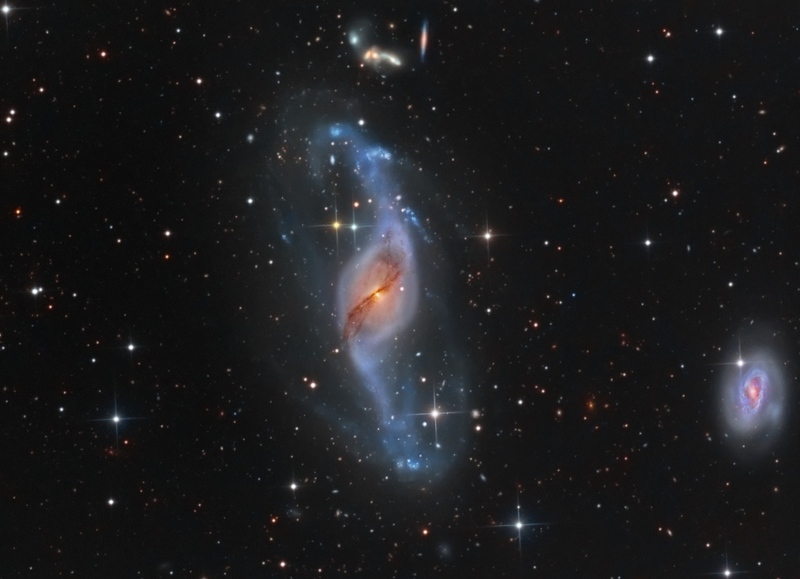 The two are likely interacting gravitationally, accounting for the peculiar appearance of NGC 3718. While this galaxy pair lies about 52 million light-years away, the remarkable Hickson Group 56 can also be seen clustered above NGC 3718, near the top of the frame. 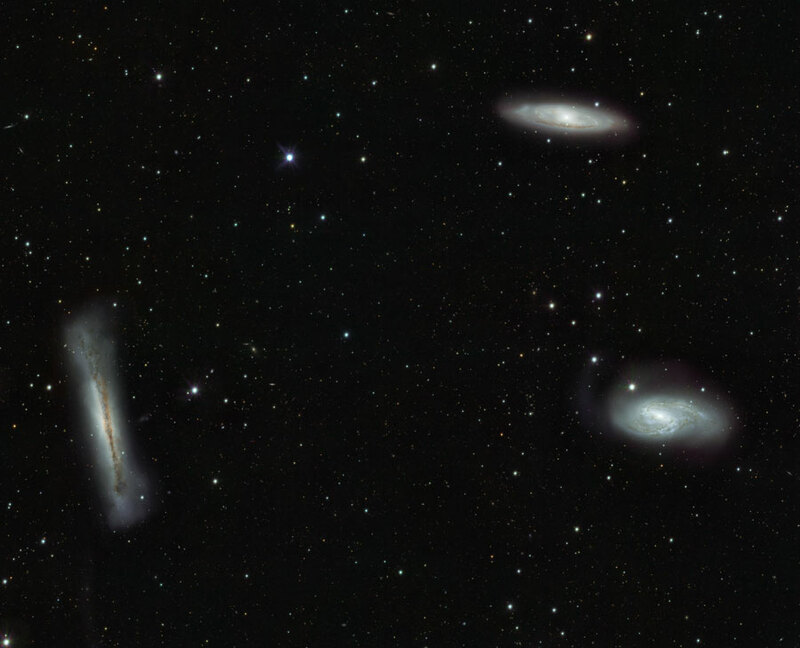 Hickson Group 56 consists of five interacting galaxies and lies over 400 million light-years away. This picture was chosen as the overall winner in the 2013 David Malin Astrophotography Competition. "Beautiful Nebula discovered between the Balance [Libra] & the Serpent [Serpens] ..." begins the description of the 5th entry in 18th century astronomer Charles Messier's famous catalog of nebulae and star clusters. 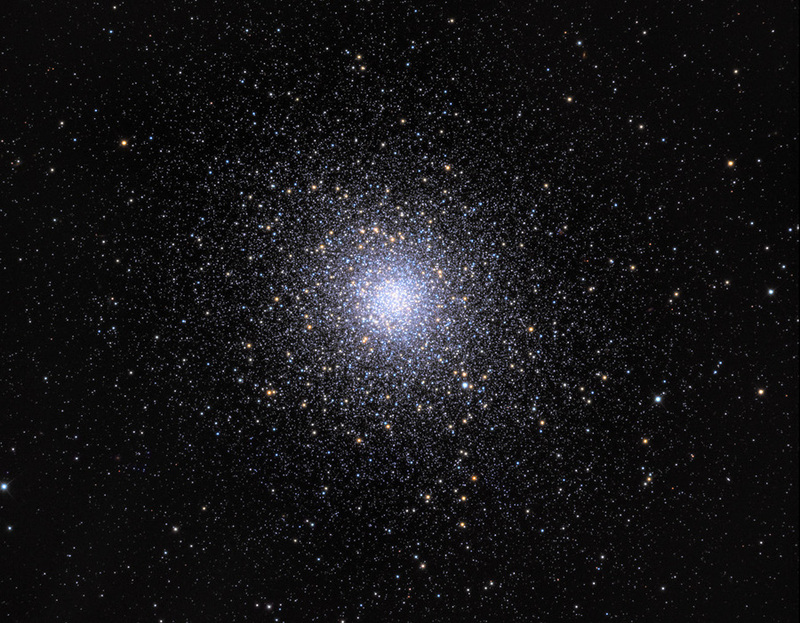 Though it appeared to Messier to be fuzzy and round and without stars, Messier 5 (M5) is now known to be a globular star cluster, 100,000 stars or more, bound by gravity and packed into a region around 165 light-years in diameter. It lies some 25,000 light-years away. 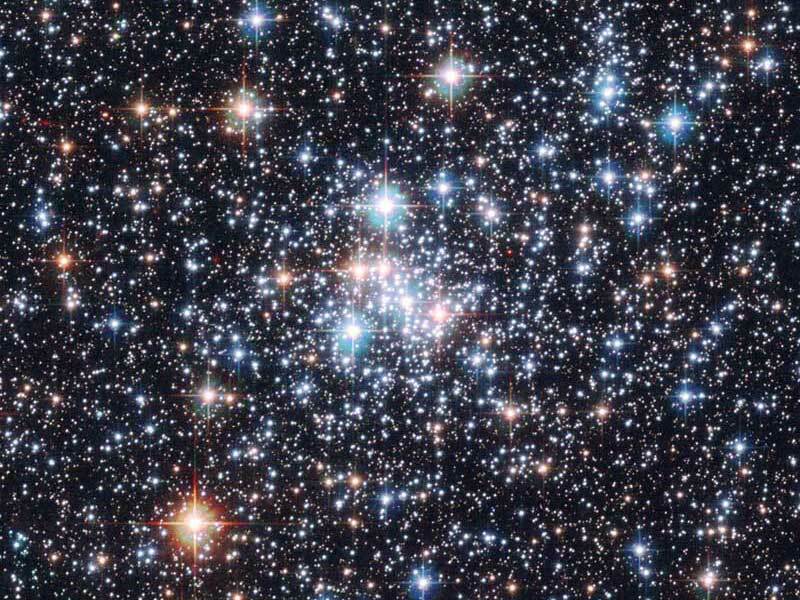 Roaming the halo of our galaxy, globular star clusters are ancient members of the Milky Way. M5 is one of the oldest globulars, its stars estimated to be nearly 13 billion years old. 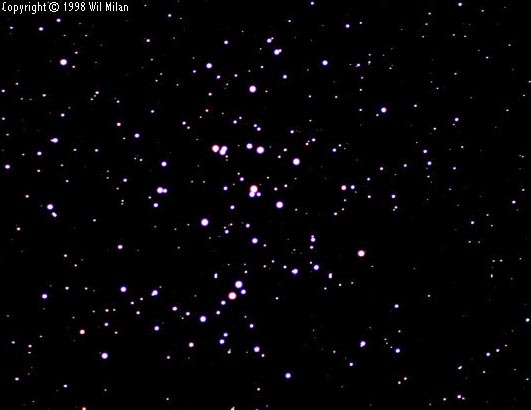 The beautiful star cluster is a popular target for earthbound telescopes. Even close to its dense core, the cluster's red and blue giant stars stand out with yellowish and blue hues in this sharp color image. 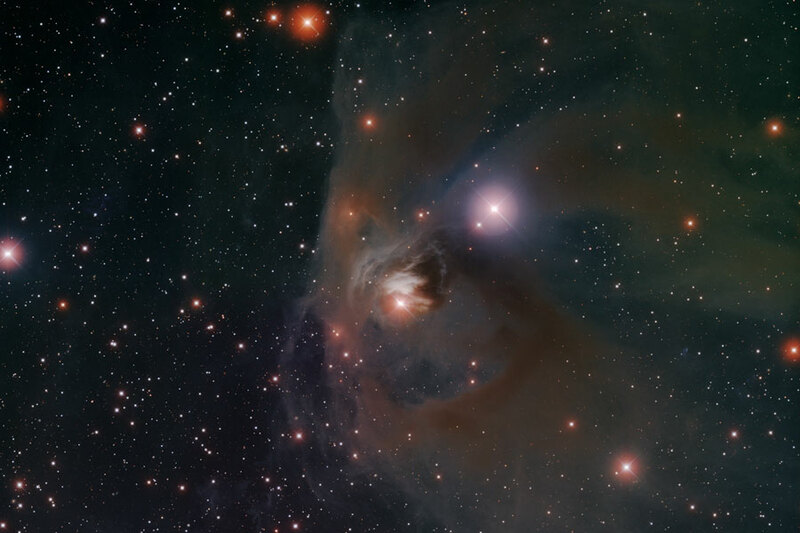 Image Credit: ESO, INAF-VST, OmegaCAM; Acknowledgement: OmegaCen, Astro-WISE, Kapteyn I. What planet is this? Although seemingly something out of The Little Prince, the planet is actually Earth. More specifically, it is a small part of the Earth incorporated into a four image stereographic "Little Planet " projection. The central fisheye image points down, while the surrounding wide-angle images were taken at a 30 degree tilt and added digitally later. Earth-anchored items surrounding the image center include green grass, dark shadows, and trees near and far. 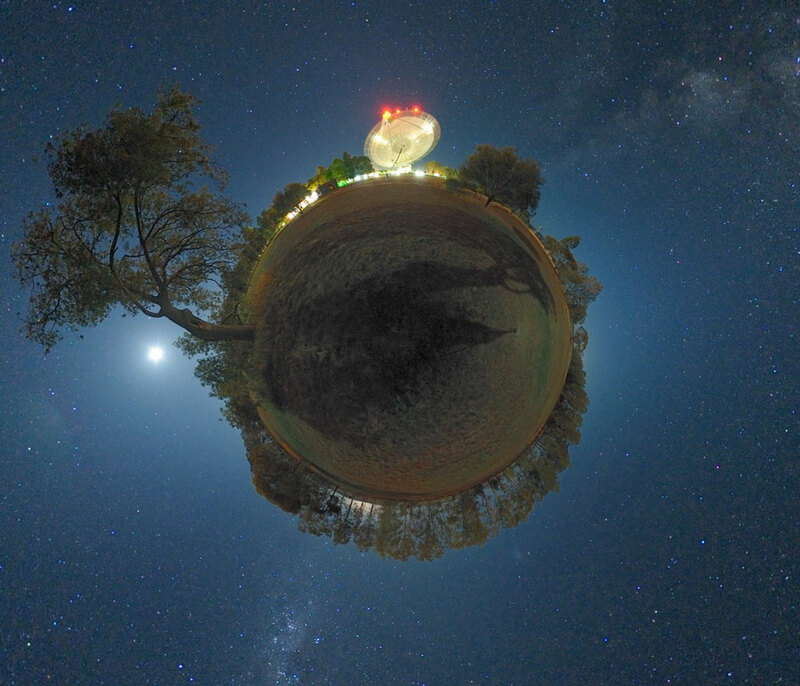 At the image top ("noon" if the planet were a clock) is the well-lit Parkes Radio Telescope dish in New South Wales, Australia. The surrounding sky contains many jewels of the night including the Moon at 9 pm, the plane of our Milky Way Galaxy at 1:30 pm and 7 pm, and the Small Magellanic Cloud galaxy at 5 pm. A full field interactive version of this scene can be found here. What does a star look like when it is forming? The prototypical example is the variable star T Tauri, visible as the bright orange star near the image center. The orange star centered in this remarkable telescopic skyview is T Tauri, prototype of the class of T Tauri variable stars. Surrounding T Tauri is a dusty yellow cosmic cloud named the Hind's Variable Nebula (NGC 1555/1554). Over 400 light-years away, at the edge of a molecular cloud, both star and nebula are seen to vary significantly in brightness but not necessarily at the same time, adding to the mystery of the intriguing region. T Tauri stars are now generally recognized as young -- less than a few million years old -- sun-like stars still in the early stages of formation. To further complicate the picture, infrared observations indicate that T Tauri itself is part of a multiple star system. Surprisingly, due to a close gravitational pass near one of these stars, T Tauri may now be headed out of the system. 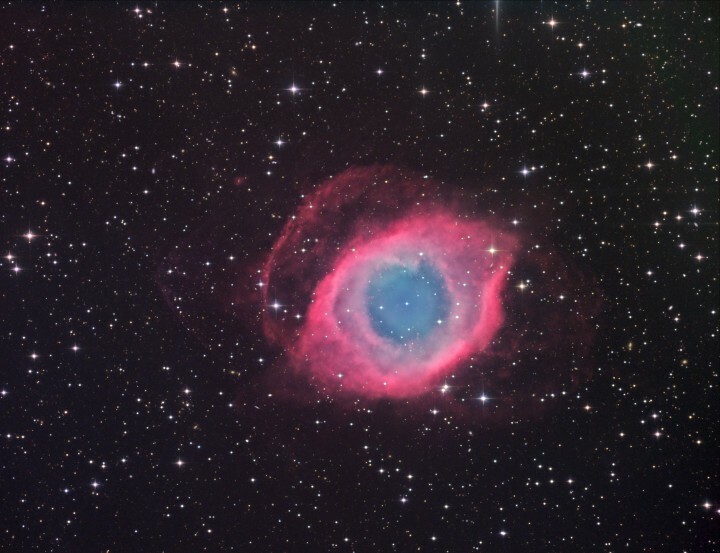 The dramatic color image above captures a region that spans about 4 light-years. 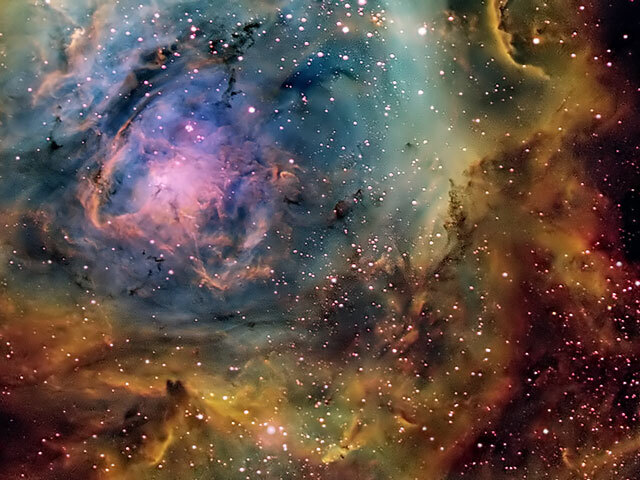 Stars are battling gas and dust in the Lagoon Nebula but the photographers are winning. Also known as M8, this photogenic nebula is visible even without binoculars towards the constellation of Sagittarius. The energetic processes of star formation create not only the colors but the chaos. The red-glowing gas results from high-energy starlight striking interstellar hydrogen gas. The dark dust filaments that lace M8 were created in the atmospheres of cool giant stars and in the debris from supernovae explosions. This spectacular portion of the Lagoon Nebula was created in scientifically-assigned colors from light emitted in very specific colors by hydrogen, silicon, and oxygen. 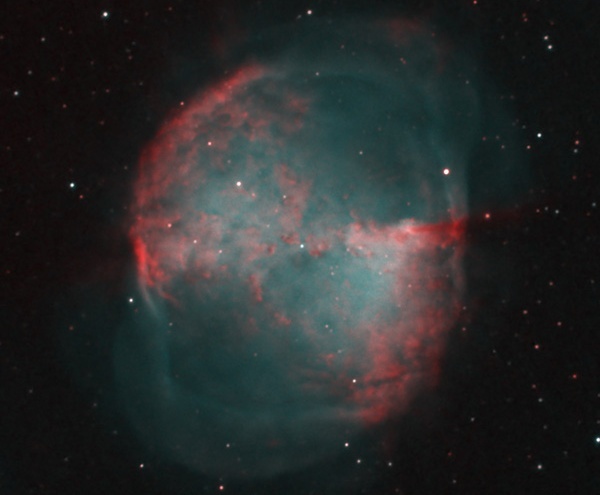 The light from M8 we see today left about 5000 years ago. Light takes about 50 years to cross this section of M8. What if you saw your shadow on Mars and it wasn't human? Then you might be the Opportunity rover currently exploring Mars. Opportunity and sister robot Spirit have been probing the red planet since January, finding evidence of ancient water, and sending breathtaking images across the inner Solar System. 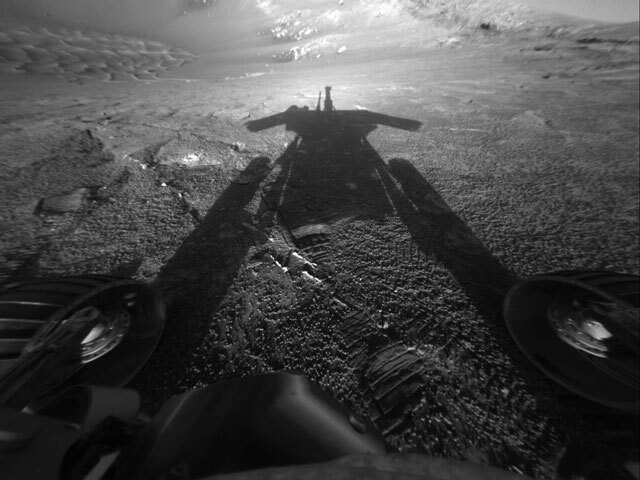 Pictured above, Opportunity looks opposite the Sun into Endurance Crater and sees its own shadow. Two wheels are visible on the lower left and right, while the floor and walls of the unusual crater are visible in the background. Opportunity is cautiously edging its way into this enigmatic crater, hoping to find new clues into the wet ancient past of our Solar System's second most habitable planet. Scientists are melting holes in the bottom of the world. 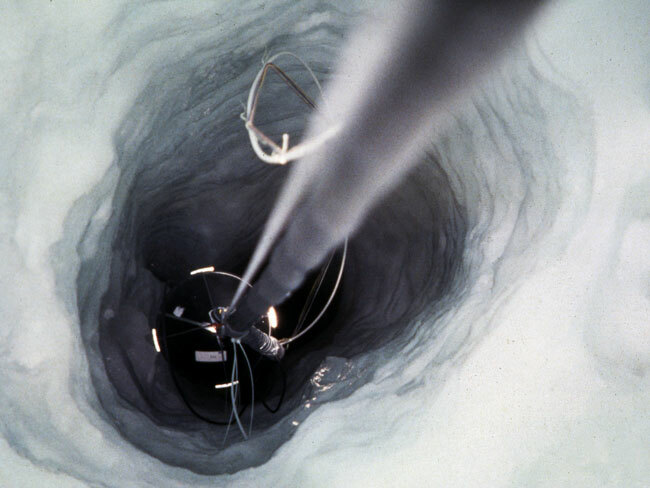 In fact, several holes have been melted near the South Pole, and they are now being used as astronomical observatories. Astronomers with the Antarctic Muon and Neutrino Detector Array (AMANDA) lower into each vertical lake a string knotted with basketball-sized light detectors. The water in each hole soon refreezes. The detectors are sensitive to blue light emitted in the surrounding clear ice. Such light is expected from ice collisions with high-energy neutrinos emitted by objects or explosions out in the universe. The above picture was taken looking down into the deep abyss. Instruments were lowered down past 2000 meters. Analyses of data from the AMANDA II detectors have recently been used to create the first map of the high-energy neutrino sky. Tuning in to the center of our Milky Way galaxy, radio astronomers explore a complex, mysterious place. A premier high resolution view, this startlingly beautiful picture covers a 4x4 degree region around the galactic center. It was constructed from 1 meter wavelength radio data obtained by telescopes of the Very Large Array near Socorro, New Mexico, USA. 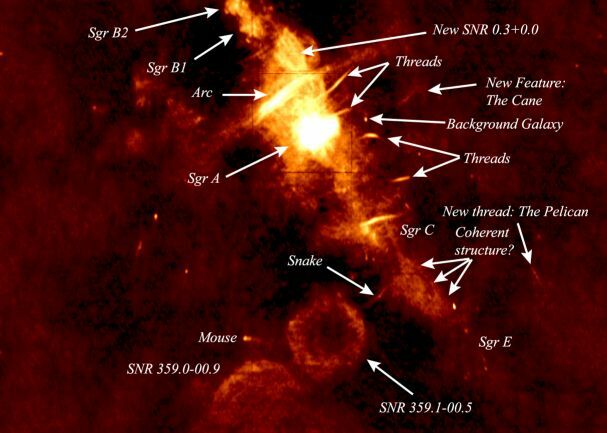 The galactic center itself is at the edge of the extremely bright object labeled Sagittarius (Sgr) A, suspected of harboring a million solar mass black hole. Along the galactic plane which runs diagonally through the image are tortured clouds of gas energized by hot stars and bubble-shaped supernova remnants (SNRs) - hallmarks of a violent and energetic cosmic environment. But perhaps most intriguing are the arcs, threads, and filaments which abound in the scene. Their uncertain origins challenge present theories of the dynamics of the galactic center. 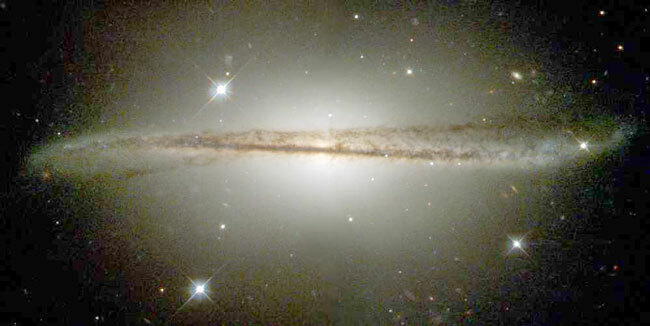 How did spiral galaxy ESO 510-13 get bent out of shape? The disks of many spirals are thin and flat, but not solid. Spiral disks are loose conglomerations of billions of stars and diffuse gas all gravitationally orbiting a galaxy center. A flat disk is thought to be created by sticky collisions of large gas clouds early in the galaxy's formation. Warped disks are not uncommon, though, and even our own Milky Way Galaxy is thought to have a small warp. The causes of spiral warps are still being investigated, but some warps are thought to result from interactions or even collisions between galaxies. ESO 510-13, pictured above, is about 150 million light years away and about 100,000 light years across. Last month the NEAR Shoemaker spacecraft swooped closer to Eros, orbiting only 22 miles (36 kilometers) from the center of the asteroid. These two images taken on July 19 (left) and July 24 (right) reveal the diminutive world's pocked and mottled surface in amazing detail, showing features as small as 19 feet (6 meters) across. Eros is thought to be a primordial, undifferentiated asteroid based on X-ray and gamma-ray studies of its surface composition. In the left picture, its surface layer or regolith is seen to be laced with bright and dark regions while in the right hand image dark regolith appears to have filled in some crater floors. The left and right images span an area about 2,600 feet (800 meters) and 3,000 ft (900 meters) wide respectively. On July 31, NEAR Shoemaker returned to its familiar 31 mile (50 kilometer) orbit, circling Eros serenely at about 6 miles per hour. The explosion is over but the consequences continue. About eleven thousand years ago a star in the constellation of Vela exploded, creating a strange point of light briefly visible to humans living near the beginning of recorded history. The outer layers of the star crashed into the interstellar medium, driving a shock wave that is still visible today. Different colors in the complex, right moving shock, pictured on the left, represent different energies of impact of the shock front. The star on the left appears by chance in the foreground, and the long diagonal line is also unrelated. 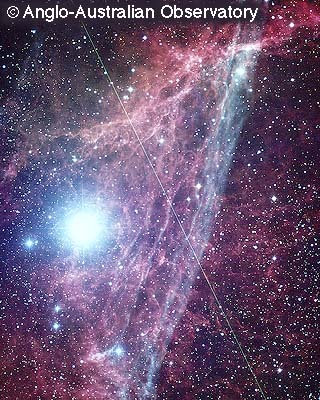 Remaining at the center of the Vela Supernova Remnant is a pulsar, a star as dense as nuclear matter that completely rotates more than ten times in a single second. What makes the colors in Jupiter's clouds? With a mean temperature of 120 degrees Kelvin (-153 degrees Celsius) and a composition dominated by Hydrogen (about 90%), and Helium (about 10%) with a smattering of hydrogen compounds like methane and ammonia, astronomers have been hard pressed to explain the blue, orange and brown cloud bands and the salmon colored "red" spot. Trouble is -- at the cool cloud temperatures Jupiter's atmospheric constituents should be colorless! Some suggest that more colorful hydrogen compounds well up from warmer regions in the atmosphere, tinting the cloud tops. Alternatively, compounds of trace elements like sulfur may color the clouds. The colors do indicate the clouds' altitudes, blue is lowest through red as highest. The dark colored bands are called belts and the light colored ones zones. In addition to the belts and zones, the Voyager missions revealed the presence of intricate vortices visible, for example, in this 1979 image from the Voyager I flyby. Centuries of visual observations of Jupiter have revealed that the colors of its clouds are ever changing. "In 1610, Galileo turned his telescope to the heavens and discovered that the planet Jupiter had four bright moons. The innermost of these Galilean moons, Io, turned out to be one of the most exotic objects in the solar system. About the size of the earth's moon, Io is covered with volcanoes, many of which are currently active. The material expelled in the volcanic eruptions may contain compounds of Sulfur which take on a variety of colors and could account for its mottled, "pizza-like" appearance. For a report of a recent eruption of an Io volcano, see the NASA Infrared Telescope Facility press release and photo.